Move over, regular — Santè Spa Cuisine in Jubilee Hills is doing wacky (but healthy) dishes and we’re in love with them. Plus, they have the greenest (and beautiful) decor one could ask for. As you walk into the restaurant, you will be welcomed by the greenery of its outdoor seating and if you want to dine with succulents and plants for a company, this works best. The indoor seating is dim-lit and decked up with a huge Buddha painting. We’re loving the top floor seating which is perfect for large groups. Plus, there is a lovely room in a corner that can accommodate private dinners for at least 15 people. Thinking of an intimate dinner with your squad or fam? Then check this out! Our meals here are elaborate, and we tried a little bit of everything. While the smoothie bowls leave you gasping for more, we loved our Sweet Potato Pancakes and Tofu Quinoa Egg Scramble. Cooked to perfection, both are served as king-sized meals and if you are someone who portions their food, you might want to share these with your pal. The restaurant emphasizes organic and healthy food, so you’ll get plenty of greens here. Plus, nothing screams of oil or masala. We also got our hands on their popular Black Hommos and asked for Roasted Garlic Mushroom on the side. 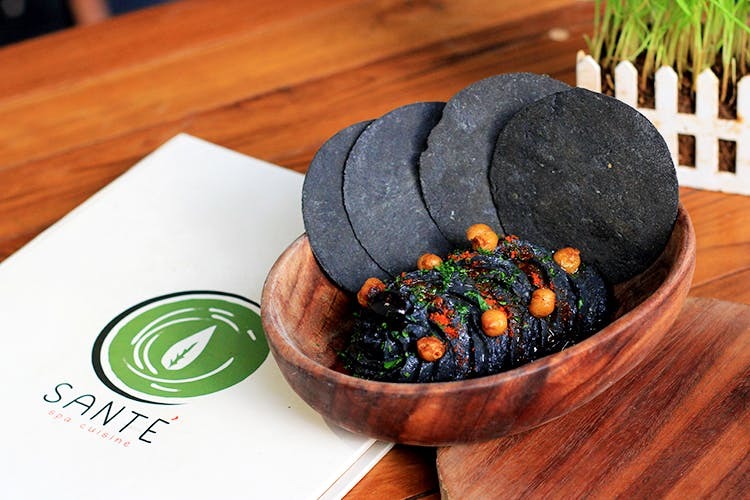 The Hommos is made from edible activated charcoal and served with multigrain khakra chips. With the chunks of delicious mushroom on the side, we feasted on. Our heart sang praises for Thai Spiced Fish Cakes — even the large quantity didn’t leave us from demolishing them tender goodies within seconds. We love how subtle the flavours in the food are. For instance, when we tried the Pan Roasted Chicken Breast, Potato Mash, we weren’t too overwhelmed by the roast. And even when the meat was crisp, it was as tender as our mash. No kidding! For dessert, we recommend Valrhona Chocolate Pie which got us licking our spoons (Honestly, we’ve eaten nothing quite like this) and Black Wasabi Ice-Cream (not for the faint-hearted) which tasted a little funny but hello, we are definitely digging into it on our next visit. They also have a lot of options for pizza, pasta, salads etc. but we are loving their eccentric and fusion dishes. Also, you can do some celeb-spotting here as Samantha Ruth Prabhu, Rakul Preet Singh frequent this restaurant with their squad in tow.